As weeks go, this one was a blogger's dream. The weekend alone included the following: manure shoveling at the farm, a Passover Seder at the Sheraton Hotel with Mountain Guy and his Jewish daughters, the arrival of our friend Asif from Los Angeles, an Easter sunrise service at the university football stadium, an afternoon Easter egg hunt, and lastly....bowling, of course. On Monday, I found myself asking, "What didn't we do this weekend?" 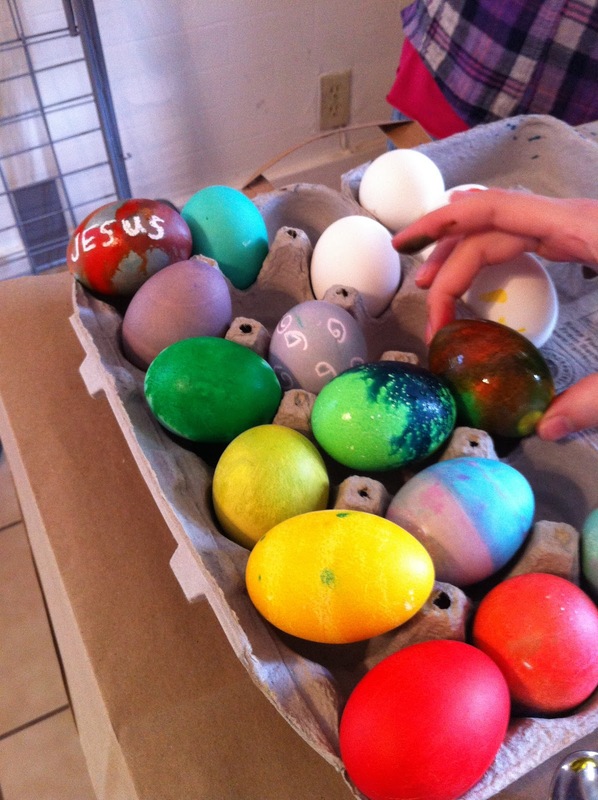 After coloring, the eggs were hidden around our apartment complex. The hunt began amidst our fellow Christian neighbor's barbeque (of pork, no doubt), and whiskey shots were had by all--except the egg-hunters, that is. "This is the best Easter ever!" I exclaimed several hours into the festivities. Alcohol was not a part of holidays when I was growing up. Turns out, it does make things a bit more fun...or, at least appear that way. But things were just getting started. We finished up the day with several hours of bowling. Why did we feel the need to go bowling on Easter Sunday? Because that is what Asif loves to do, not having many handy bowling alleys in India where he lives. Perhaps it will become an Islamic Easter tradition. I don't know if it was the multi-faith extravaganza or simply an overwhelming number of events, but I find that I am still unpacking, evaluating, and suffering from a touch of writer's block. Feast and famine, I suppose. Maybe I'll go eat an egg. And next year, I think I'm gonna celebrate by cutting back on my observance...and whiskey.